"You have that just-rolled-outta-bed smell." This is one of Roddy's (my son - age 6) favorite shows but, unfortunately, he was unable to join me in my review of this disc. Let me be frank with you - Bear (the main character) scares me!! I know it is just a guy in a bear suit, but that doesn\'t ease my fear at all. All fears aside, this is a wonderful kid's show and this disc is very good as well. 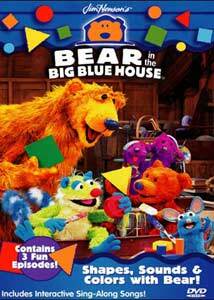 For those of you who have yet to be frightened by Bear, this show is a Henson production with Bear and his friends Ojo (a smaller bear), Tutter (a blue mouse), Treelo (a green monkey), and Pip and Pop (a pair of purple weasels). We get three stories focusing on (surprise) colors, shapes and sounds respectively. In the first episode, "A Wagon of a Different Color", Bear and his pal Tutter have plans to go to the market, but Bear cannot go without his trusty wagon. After searching the house for it, he finally finds it in the attic being painted by Ojo, with help from Pip & Pop. We learn about mixing the colors red, blue and yellow to make various other colors. In "The Shape of a Bear", Ojo is playing with blocks and we get to learn all about the different shapes and things around the house that employ these particular shapes. Lastly, we have "Listen Up", where everyone in the house is going on an overnight camping trip except for Treelo who is a bit apprehensive. Prior to the trip, we learn of the various sounds we hear around the house each day and do not even realize we hear. Later, we hear the sounds of the outdoors. I like this show because the characters are very polite and well-spoken. The lessons are more educational than preachy, which is probably why Roddy likes it. If only I could get over my senseless fear of Bear, everything would be right with the world! Image Transfer Review: For a television show transferred to disc, the picture looks absolutely wonderful. Contrary to what the show's title would have you believe, the "blue" house is actually full of vibrant colors, all of which seem to jump off the screen. Unfortunately, this made Bear seem all too real and really frightened me. There was no visible artifacting and some slight edge enhancement that I noticed in one scene. Audio Transfer Review: The audio on the disc is as good as can be expected from a TV show. Two channel Dolby Digital with very clear dialogue. No surrounds, but that was not something that I expected and it is not necessary. The only drawback is that there is not much directionality making the front soundstage seem very small. Bear does have a nice singing voice though. Extras Review: The one problem I have with most kid's discs is that they usually contain very little, if any, extras. This disc is no exception. All we get is Sing Along Songs. There are four of them and we can follow along with the words on the screen. One problem though, once a song is selected and played, you do not get sent back to the menu. It just continues to the next song until the last song plays. I noticed this on another Columbia disc as well—very strange. Despite the lack of any meaningful extras, this is a pretty good disc. The educational stories are nice and the video quality is a cut above most TV-to-DVD releases. If you are not frightened by Bear and your kid likes the television show, go ahead and get this disc.